Egyptian antiquities police have discovered an ancient burial site under a modern house near the Great Pyramids of Giza, they said on Sunday. In an official statement, the General Administration of Tourism and Antiquities Police said the discovery was made as part of their ongoing efforts to detect illegal excavations at archaeological sites. According to the statement, the police concluded that a resident of Giza's Nazlet El-Samman district near the Pyramids had illegally dug under his house looking for ancient artefacts. 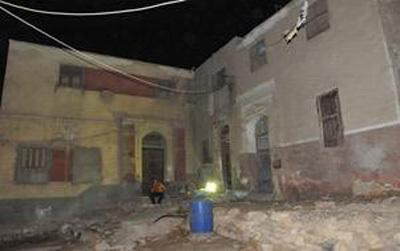 It added that two illegal excavations were found, one 1.5 metres deep and the second four metres deep. Within one excavated area, a corridor was discovered, which led to a rock-hewn room with dimensions of 2 metres by 2.5 metres. Inside the room was a false door, behind which was a well carved into the rock. 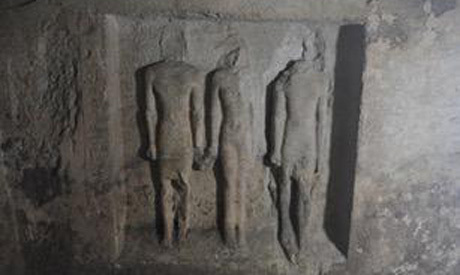 In the other excavated area, a room housing six wall-relief statues was discovered. Some of the statues had smashed heads and legs, the statement read. The statement did not give further details about the nature or age of the discoveries, which it described as "an ancient burial site." The police are planning to arrest the owner of the house, who has fled. A number of people have been killed in recent years in Egypt while attempting to excavate in search of ancient artefacts, which is illegal without the proper permits.